I view eggnog as virtually one of the most evil decadances invented (I mean that in a good way). It's brilliant in ice cream, it works in cookies too, and there's really nothing better than eggnog bread. I remember sneaking several cups of hot rum with floating homemade eggnog at a family Thanksgiving as a teenager (it was just so yummy!) I don't really go for the hard stuff so much anymore. I'm more of a low-fat eggnog kinda gal these days. But when I decided to make a little breakfast treat for my kid's teachers, I went full-fat all the way. 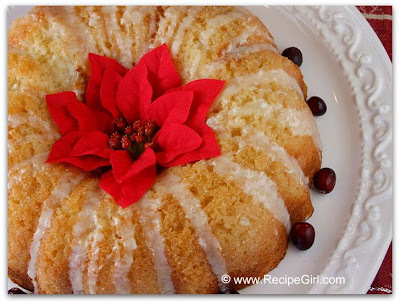 I knew that would be best for Overnight Eggnog Coffee Cake with Nog Glaze. 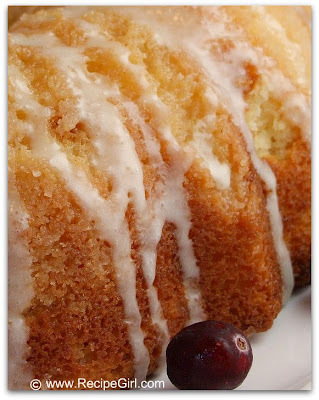 Easy to make, this coffeecake is prepped the night before, covered and left in the fridge overnight. 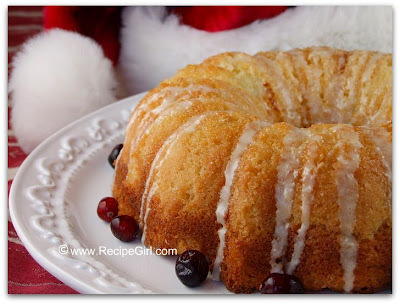 It's simply placed into the oven in the AM, dumped onto a rack to cool and drizzled with eggnog flavored glaze. 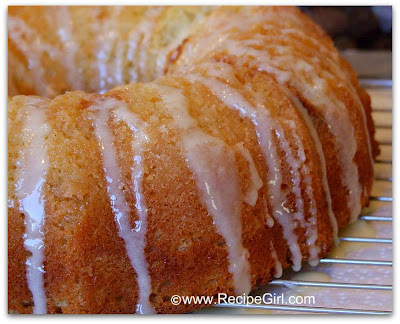 Most of the glaze literally soaks into the cake. It turns out to be incredibly tender and moist. Lazy folks can make this in a 9x13 pan, but it's a little prettier if you bake it in a molded pan. Decorate with a few cranberries for decor (or not) and it's ready to eat. When I went to the teacher's room after school to retrieve my plate, there was not a speck of cake left. The school secretary reported that this was indeed a popular RecipeGirl treat and that two teachers literally squabbled over who was going to get the last piece.